As a solution to European Commission’s (EC) accusation that Microsoft’s inclusion of Internet Explorer (IE) as part of the Windows OS has violated EU Treaty law on abuse of dominant position (Article 82), the Redmond company has initially decided to distribute Windows 7 E SKUs to customers in European Economic Area (EEA). Windows 7 E removes the Internet Explorer 8 browser frame window and menus (user interface), which otherwise will install by default upon Windows 7 installation. Now, Microsoft has made another proposal of adding a web browser “Ballot Screen” to Windows 7, Windows Vista and Windows XP users in EEA area. 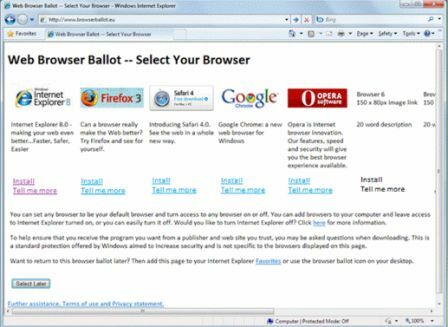 The browser ballot screen will allow users to choose their preferred web browsers, including Internet Explorer to be installed. The trick is, Internet Explorer will now be enabled by default (no need to install a browser without browser in Windows 7 E) to load the ballot screen, although IE8 can still be disabled at ease. The “ballot screen” of web browser selection has long been preferred by many web browser competitors to IE, as it provides free brand marketing and traffic. Under the Microsoft proposal, a Ballot Screen software update will be distributed and installable via Windows Update at the priority level “Important” for Windows Vista and Windows 7 users and “High Priority” for Windows XP users. If the proposal is adopted by European Commission, the Ballot Screen update will first be made available to users by the date of the general commercial release of Windows 7, or within two weeks of the adoption. For Windows XP and Windows Vista users the Ballot Screen update will first be made available between 3 and 6 months after the adoption of the Commission’s decision under Article 9 of Regulation 1/2003. Once the Ballot Screen software update is installed, it can be used immediately once user logs on to the computer the next time. Only users who have Internet Explorer set as their default web browser will be prompted with the Ballot Screen. A possible Browser Ballot Screen pointing to www.browserballot.eu as shown in PPT by Microsoft. Other than the Ballot Screen, Microsoft is also committed to allow vendors and OEMs to pre-install any web browser (or browsers) of their choice on PCs they ship and to set any browser as the default web browser freely. If the Ballot Screen proposal been accepted, which is likely as European Commission press release has welcomed the proposal, it will mark the end-of-life (which yet to see the light) of Windows 7 E editions. Instead, end-users inside EEA zone will receive the full package and functionality standard product that is the same with the rest of the world. The only difference between EU or rest of the world users is that EU end-users will receive the Ballot Screen update package via WU, or preinstalled on their new machine. Windows 7 E will only be made available if European Commission does not accept the Ballot Screen proposal by general commercial release of Windows 7 which falls on October 22nd, 2009. Currently, only one pre-RTM Windows 7 E Build 7264 been leaked for download. Windows 7 Ultimate E RTM 32-bit and 64-bit ISO has been leaked for download. Update: Windows 7 E is now end of life, and will not be released, no matter ballot screen proposal is accepted or not. According to Microsoft’s press release, Microsoft will begin work at that time to begin implementation of Ballot Screen with PC manufacturers, once EC accepts the proposal. Also part of the settlement terms with the EC is to promote interoperability between third party products and a number of Microsoft products, including Windows, Windows Server, Office, Exchange, and SharePoint. Check out the full coverage information on Windows 7.